Wheel easily with a Union Tools Double Wheel Steel Wheelbarrow. Excellent for yard work and landscaping, this wheelbarrow transports medium to heavy sized materials. The wheelbarrow's polyethylene construction makes for a rugged and durable product. This quality wheelbarrow can be appreciated by contractors and do-it-yourself homeowers alike. 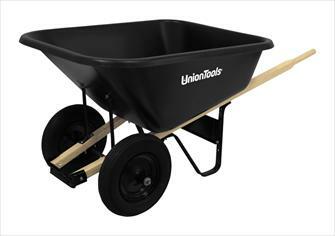 The Union Tools wheelbarrow has two wheels for greater stability and handling and can perform any job you have. The cold rolled steel undercarriage and strong, seal-coated hardwood handles provide enough strength for the toughest applications. In addition, this wheelbarrow comes equipped with dual 16" wheels. Also, the UV stabilized pan keeps this wheelbarrow looking good for many years.